I can just barely recall one bleak Monday morning on my way to elementary school. The daily routine of the bus ride was broken by two rowdy Older Kids in the back row feverishly throwing cards onto the floor of the bus, apparently in a great rush to finish some kind of game before the driver forced us to get out and go to class. Although I had no idea what was going on, the players seemed like they were having so much fun that I had to ask them what they were up to. "Magic: The Gathering" they told me. "It's the hottest new trend. All the kids are doing it." I was intrigued enough to take a trip to my local card shop and buy myself a starter deck and a couple of booster packs. I believe that was right around the time of the third or fourth edition. Now, 15 years and 13 Magic editions later, I finally learned the rules, sifted through the boxes upon boxes of cards that my friends had compiled over the years, bought some cards of my own, and started playing the game. ...with your deck of Magic cards representing the spells in your arsenal. Some of these spells allow you to Summon Creatures, both ordinary and mythical, to fight for your side. Powerful Sorceries can make these creatures stronger, protect them from harm, or destroy ones that your opponents possess. Instants can Interrupt spells cast by your opponents or deal damage directly to them. And Enchantments can alter the very rules of the game itself. All these work towards the simple goal of reducing your opponent's health from 20 to 0 before s/he does the same to you. I won't bore you with these rules here; I'm more interested in the broader implications about what different types of Magic cards tell us about the people who use them. 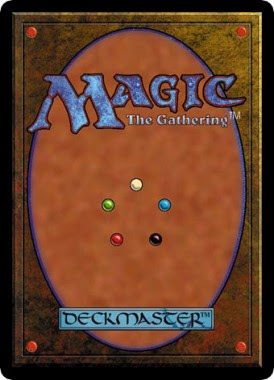 Most every spell in the game can be classified into one of the following five colors: White, Blue, Black, Red, or Green. These colors represent what type of "mana" you need to use in order to cast that spell. Mana, produced by different types of Lands, acts as the game's currency/energy source necessary for you to use all your weapons. In order to understand the types of people who play Magic, you need to understand the five types of mana. Each of the five colors of mana represent a particular style of play, with specific strategies accompanying the use of each. But more than this, each color also represents values, beliefs, or aspects of a particular personality type. By understanding the guiding principles behind each of these five colors, one can make their Magic deck a pretty accurate representation of themselves. Here's what the official Magic website has to say about the about each color, followed by some short analysis. White mana is produced by Plains. Some typical white creatures include knights in shining armor, glittering angels, pretty unicorns, and tiny hobbit-like Kithkin. Many of these creatures have special abilities that make each other stronger, prevent damage, or even cause a player to gain life. People who play with White decks generally like to have all their ducks in a row, who like to keep themselves and their things very well protected. They don't like to rush into things, but given enough time to build up, they can usually muster a potent force. Blue mana comes from Islands. A good Blue deck isn't about the force you can build up, but rather about frustrating your opponents and capitalizing on their mistakes. Among the hallmarks of Blue cards are spells that send creatures back to their owners' hands (either used on your opponents to slow them down or on your own creatures as a defensive measure), creatures whose attacks can't be blocked, and abilities that let you control what cards get put into your hand. But Blue has one type of spell that sets it apart from all other colors: counterspells. You can play them at any time - on your opponent's turn, right after they cast a spell - and they effectively make it as if that spell never happened: instead of taking effect, the card your opponent tried to play goes immediately into his or her "graveyard" (read: discard pile). Blue also has spells that can take control of any other creature on the battlefield, using your opponent's biggest weapons to supplement your army of wizards, merfolk, and various other aquatic creatures. People who play Blue decks are generally reactive, opportunistic, and like to have the last word in any argument. Black mana comes from Swamps, a fitting abode for the vampires, zombies, skeletons, ghoulies, and ghosties that make up the majority of Black creatures. Black spells are mainly about destroying creatures and then taking control of them right from their owners' graveyards (even your own, if necessary)! Black cards are powerful, relatively cheap (mana wise), and very very scary. But because Black spells are so cost-effective, they often require sacrifices from those who cast them - either in the form of paying life, sacrificing a creature of their own, or discarding a card from their hand. Black decks are for people who are willing to do whatever it takes to avoid losing... and who have a high tolerance for frightening or disturbing images or ideas. Red mana, produced by Mountains, fuels Red's sudden flashes of lightning or scalding balls of fire, which deal damage directly to creatures or to opponents. These spells provide good support for creatures such as hardy dwarves, reckless goblins, lumbering ogres, and fierce fire-breathing dragons. Red decks are all about a two-pronged offense: throw your creatures against your enemy's defenses while saving up enough mana for a giant, crushing, unavoidable direct damage blow. Playing a Red deck involves neither a lot of planning nor a lot of thinking ahead - Red is all about being aggressive, living in the moment, and striking when your opponent least expects it. All Green creatures - from nimble and wise Elven Rangers and Druids, to primal and/or graceful wild beasts, to ancient and solid Treefolk - make their homes in the Forests that produce Green mana. Green decks live and die by their creatures, which are by far the largest and most powerful in the game, including a plethora of spells to instantly or gradually make these creatures stronger, faster, or harder to destroy. People who play Green decks enjoy commanding an arsenal of impressive and personable creatures, supporting them using methods drawn from the natural world, and sending them on an unrelenting assault against your enemies. NEXT WEEK: How Race/Class combinations in Dungeons & Dragons reflect the socio-economic differences in our society!